Day of the Dead is celebrated in Mexico between October 31st and November 2nd. It's a time to remember deceased loved ones and honor them. Day of the Dead is a festive occasion, a time to celebrate, much like a family reunion. Making an altar (or ofrenda as it's sometimes called in Spanish) for the occasion can be a way for you to honor the life of someone who was important to you, or remember your ancestors. There are no hard and fast rules about how the altar should be made -- it can be as simple or as elaborate as your creativity, time and materials allow. Be creative and make something that looks attractive and is meaningful to you. Here are some of the elements you may wish to include on your altar and some ideas about how to put it all together. The arch: If you have long sugar cane stalks, tie one to each of the back legs of the table and join them at the top (tie them together with string or use tape). Then, if you want, you can decorate the arch, attaching flowers to it. The arch represents the passage between life and death. If you can't get sugar cane stalks, get creative and make your arch out of other materials. The base: Place boxes or crates on the table where you will build your altar in such a way as to create tiers so that the elements of the altar can be displayed attractively. Put a tablecloth over the table and boxes so that the boxes are hidden. Then place the papel picado around the edge of the table and each layer. Photo: Place a photo of the person to whom the altar is dedicated on the top level of the altar, in the center. If the altar is dedicated to more than one person, you can have several photos, or if your altar is not dedicated to anyone in particular, the photo can be omitted and it will be understood that your altar is in honor of all your ancestors. Water: Place a glass of water on the altar. Water is a source of life and represents purity. It quenches the thirst of the spirits. Candles: Candles represent light, faith and hope. The flame guides the spirits on their journey. Sometimes four or more candles are placed together to form a cross which represents the cardinal directions, so that the spirits can find their way. Flowers: You can place flowers in vases or pull the petals out and scatter them over all the surfaces of the altar. If you use cempasuchil (marigolds), the scent will be even stronger if you pull out the petals. The bright colors of the marigolds and their fragrance are synonymous with Day of the Dead. Fresh flowers remind us of the impermanence of life. Fruit, bread and food: Seasonal fruits and special bread called pan de muertos are usually placed on the altar, along with other foods that the person enjoyed in life. Mexicans usually place tamales, mole and hot chocolate on the altar, but you can use whatever fruit and other food are available to you. See a list of the foods of Day of the Dead. The food is a feast that is laid out for the spirits to enjoy. It is believed that they consume the scents and the essence of the food. Incense: It is customary to burn copal incense, which clears the space of any negative energy or bad spirits, and helps the dead find their way. If you don't have time or the materials to make an elaborate altar, you can make a simple one with just a photo, two candles, some flowers and fruit. The important thing is that it's meaningful to you. Sugar skulls are a great addition to a Day of the Dead altar. Making them can be a fun project. Learn how to make sugar skulls. 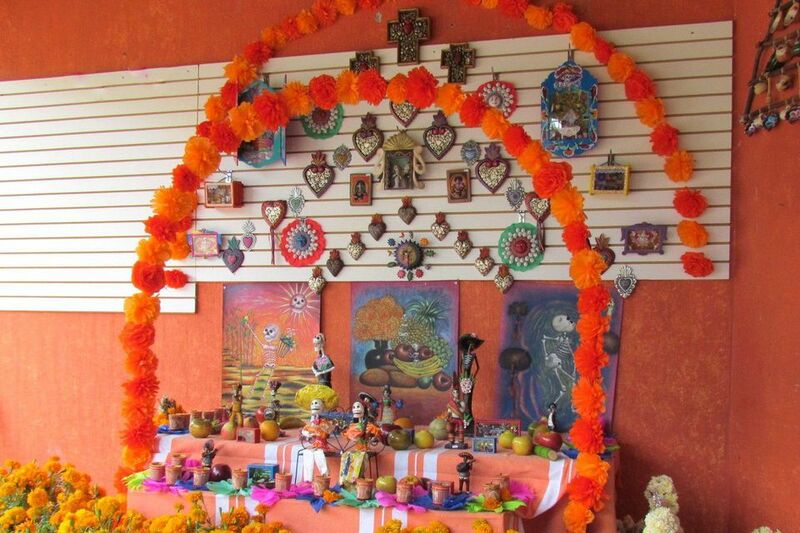 Get ideas by looking at photos of Day of the Dead Altars.